If you love culture and history or simply want to learn about the colourful traditions of the people of Brasov, the Ethnography Museum of Brasov promises to be one of the most interactive spaces in the city. From folk costumes that includes old photographs to show just how these garments were designed and worn to the exhibits that show the evolution of spinning and weaving, the art of embroidery and textiles that were produced here, the museum gives you a thoroughly learning experience. 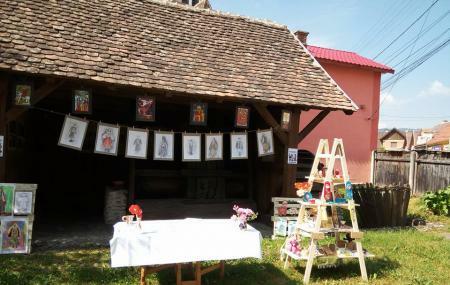 The Transylvanian fair exhibit is a reproduction of the stalls where the drapers and weavers would work and sell their goods. You can see just how the demarcation of societal statue, occupation and wealth was made in the course of history in Brasov. The souvenir shop where you can buy carved spoons and beautiful ceramic egg cups along with other gifts. I love this museum! There are two halls, and one of them seems recently renovated or added. The information is mostly displayed in Romanian, but you can find several guides in English. There are also interactive ways of presenting information: picture screens, videos etc. The admission is 5 lei for adults and there are discounts for students. There are nice local products for sale as well, accessibly priced. I bought an original martisor for 10 lei. This is an outstanding, small museum. Items of daily life in Old Romania. Some great films and AV aids. Astonishing is the loom which eaves trim. The director can start it and you can watch it make trim. A nice gift shop selection as well. No foreign languages for displays.